Sorry... the 2017 Toyota Sequoia is no longer being sold as new. Instead, take the first step to a great deal on 2019 Toyota Sequoia with a free price quote! 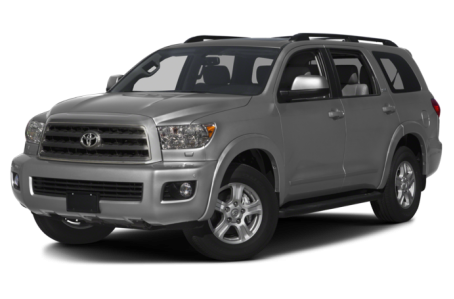 The 2017 Toyota Sequoia is a full-size SUV that seats 7 or 8 passengers. It competes with the Ford Expedition, Chevrolet Tahoe, and Nissan Armada. This year, it remains largely unchanged. Three trims are available: the SR5, Limited, and Platinum. Overall, the Sequoia has a large blockish appearance with rounded edges and corners. The massive front grille is styled like those found on heavy-duty trucks. It is flanked by rectangular headlights, which proportionally match the lower fascia. Standard features include front fog lights, power/heated side mirrors, running boards, 18-inch alloy wheels, a power moonroof, and a rear spoiler with LED center lighting. Also available on the Sequoia is a power liftgate with jam protection, 20-inch diamond-cut finish alloy wheels, and chrome door handles. Under the hood, the Sequoia sports a 381-hp, 5.7-liter V-8 engine mated to a 6-speed automatic transmission. It is available in both rear-wheel drive (RWD) and 4-wheel drive (4WD) and offers an available Multi-Mode 4WD dial that allows the driver to switch between RWD and 4WD modes. Both powertrains provide 13/17 mpg city/highway. The Sequoia features an impressive towing capacity of 7,400 pounds making it ideal for towing anything from boats to campers. Inside, the Sequoia has a standard fabric interior with a 40/20/40 split-folding second-row bench seat and a 60/40 split-folding third-row seat. The second-row bench seat can be swapped for a pair of captain’s chairs, which reduces seating to 7 passengers. The center stack features a standard Entune multimedia system that includes a touchscreen, Bluetooth connectivity for phone and audio, Siri Eyes Free Mode, and two USB ports. It can be upgraded with an integrated navigation system and a JBL premium audio system. Tri-zone automatic climate control, cruise control, and remote keyless entry come standard. Leather upholstery, heated/ventilated front seats, heated second-row seats, a memory seat, and a Blu-ray entertainment system with a 9-inch display are available as well. The Sequoia comes standard with Toyota’s Star Safety System, which includes vehicle stability controls, traction control, a backup camera, and Smart Stop Technology. A blindspot monitoring system, lane change assist and adaptive cruise control are also available.